This page will be updated as events and event details are announced. Image from 63yearslater online exhibition. Ongoing online exhibition: Our Stories: Immigrants of America. Eugene, OR Artist: Melissa Nolledo. Ongoing event: School of Journalism and Communication student exhibition, “63 Years Later.” Exhibition runs Summer 2018 on the 2nd Floor of Allen Hall. Follow the title link for the online exhibition. Ongoing online exhibition: Our Stories: Immigrants of America. Eugene, OR Artist: Melissa Nolledo. Special exhibition event at the Asian Celebration, February 16 & 17. Ongoing event: Jordan Schnitzer Museum of Art exhibition, “Re-framing the Fragments: The Best We Could Do.” Exhibition runs September 21, 2018-February 17, 2019. Please also see the accompanying Visitors Guide to the exhibition. February 1, 2:00-3:30PM, Knight Library 101, Teaching Engagement Program, Faculty and GE Workshop on Engaging Comics in the Classroom. Facilitated by Thi Bui. 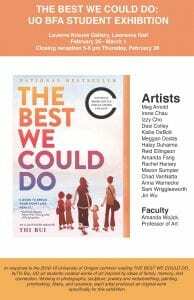 February 1, 11AM-Noon, PLC 180, Live reading of The Best We Could Do with Thi Bui. Followed by Q&A. 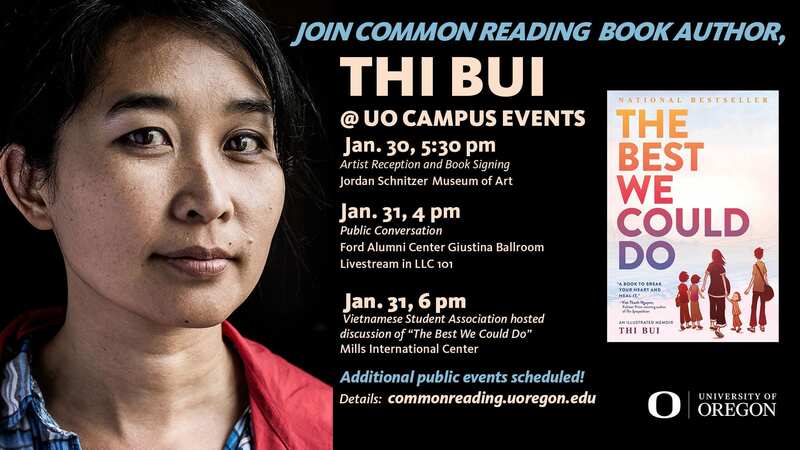 January 31, 6PM, EMU Multicultural Center, Vietnamese Student Association led discussion of The Best We Could Do and Thi Bui’s public conversation. All students invited. January 31, 4:00pm, Ford Alumni Center Giustina Ballroom, Thi Bui in Public Conversation with Dr. Tuong Vu (Political Science) and Dr. Lynn Fujiwara (Ethnic Studies). Livestream to LLC 101. Opening remarks by Doneka Scott, UO’s Associate Vice Provost for Student Success, and Julie Voelker-Morris, Common Reading Faculty Fellow. 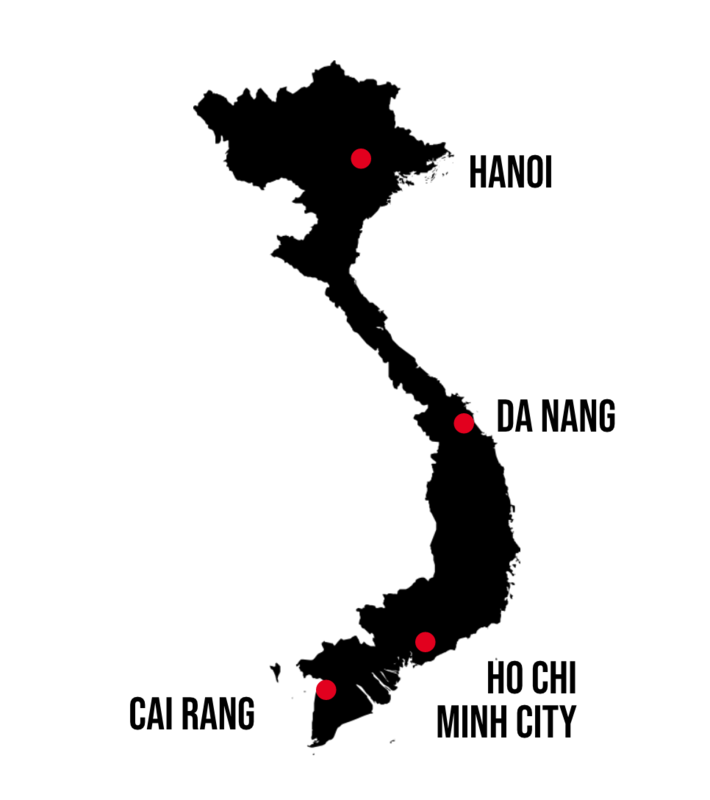 January 30, 5:30-8PM, Jordan Schnitzer Museum of Art, Artist Reception and Book Signing featuring Thi Bui and Ann Le. 5:45 – Opening remarks by Jill Hartz, Ann Le, and Thi Bui. 6:20— Book signing. November 17, College of Education, UO Equity and Social Justice Teach-In. Featuring a workshop with UO Composition students and faculty Stephen Rust and Jenee Wilde and their application of Common Reading texts in their courses. November 1, 6:30pm. 175 Knight Law Center, Nativism & White Supremacy: Oregon, the U.S., and Europe, A discussion featuring Jess Campbell, Rural Organizing Project; Terri Givens, author and professor; Zakir Khan, CAIR-Oregon; and Laura Pulido, UO Ethnic Studies. Oct. 25, 6:30 p.m., 175 Knight Law Center, War and the Media: 1960s to the Trump Era with Norman Solomon, journalist, activist, and author. October 4, 5-8pm, Faculty Club, Jordan Schnitzer Museum of Art. Toast at 6pm. Fellowship, drinks, and exhibition tour of “Re-framing the Fragments: The Best We Could Do” exhibition. Also see the Visitors Guide to the exhibition. Follow the exhibition tour by attending Schnitzer Cinema. September 17, 3:30-4:15, Library 101. Common Reading tabling at UO New Faculty Orientation. September 21, 9-11am, Matthew Knight Arena, College Block for all students. Make art, engage with digital media, and learn more about the 2018-2019 Common Reading selection. 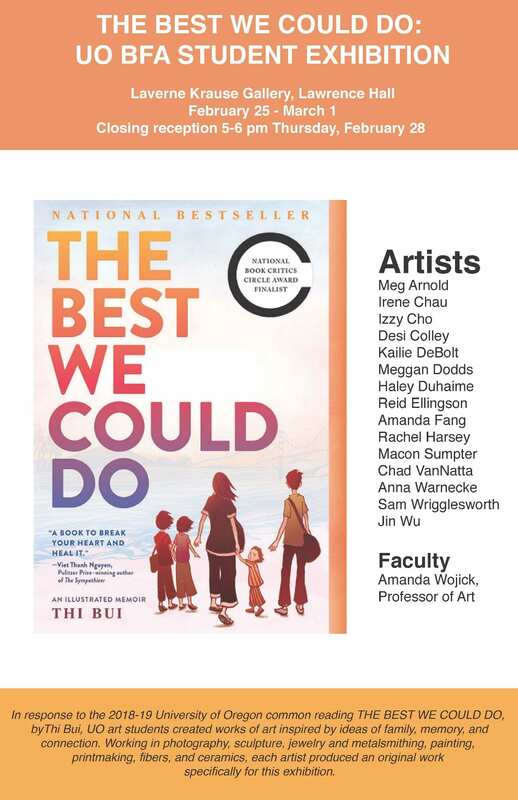 A special room on the 4th floor of the Ford Alumni Center will be set aside for students to informally discuss Thi Bui’s The Best We Could Do with other students and faculty. September 21, 7-9pm Jordan Schnitzer Museum of Art. Opening Reception for “Re-framing the Fragments: The Best We Could Do” exhibition. September 13, TBD, Common Reading tabling at UO Summit for Academic Leaders. April 25, 2018, 2:30-4:30PM, Ford Lecture Hall, Jordan Schnitzer Museum of Art, CSWS Northwest Women Writers Symposium Panel: “The Border and Its Meaning: Forgotten Stories,” featuring Pulitzer Prize finalist Laila Lalami. April 22, 2018, Submissions due for “Honoring Our Rivers” contest for student submissions of art, photography, poetry, and writing. Ongoing Event: Global Scholars Hall lobby exhibit, We Just Keep Going, a first-year student exhibit responding to themes from Louise Erdrich’s The Round House. 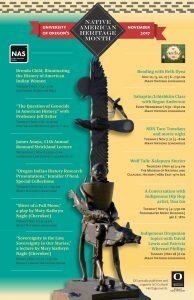 Events listed below, sponsored by the Native American Studies and the Division of Equity and Inclusion. 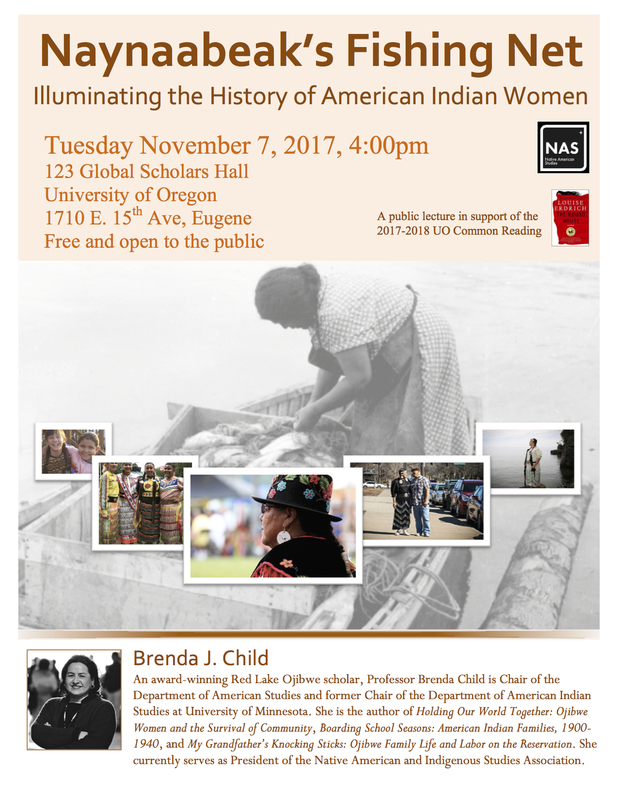 List of events sponsored by the Native American Studies Department relating to the Native American Heritage Month at the University of Oregon. November 17, Noon, Knight Library Browsing Room. “Sovereignty in the Law, Sovereignty in Our Stories” featuring Mary Kathryn Nagle, lawyer and playwright. November 7, 4-5:30pm, 123 Global Scholars Hall. Naynaabeak¹s Fishing Net: Illuminating the History of American Indian Women. 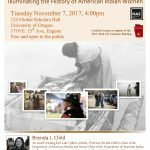 A public talk by Red Lake Ojibwe scholar Brenda J. Child. November 7, 6-7:30pm, Hop Valley Brewing (990 W. 1st, Eugene). 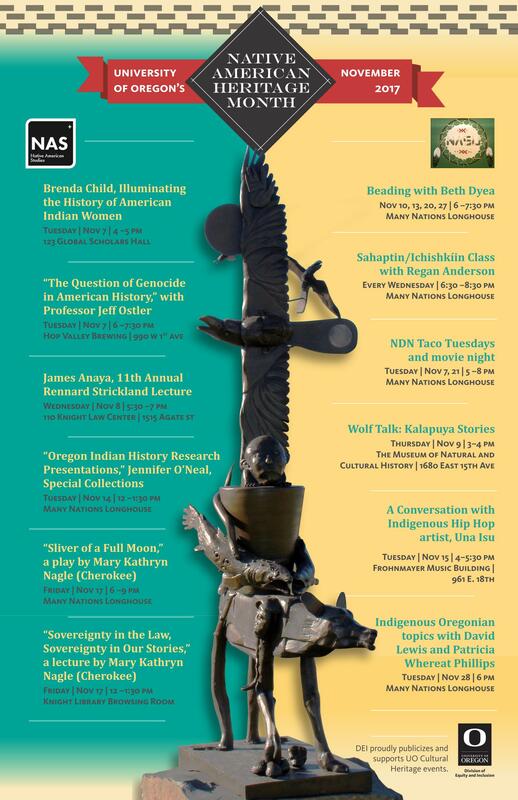 The Question of Genocide in American History, a UO History pub talk with Professor Jeff Ostler. October 12, 12-1:30PM, Knight Law School Room 110,“Indigenizing Environmental Justice in Indian Country” with Dina Gilio-Whitaker.